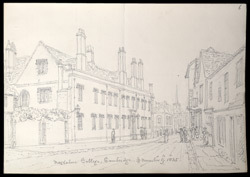 Magdalene (pronounced "maudlin") College, founded in 1428 by Henry VI, is located in the centre of Cambridge beside Magdalene Bridge which crosses the River Cam. Although it is the smallest of the colleges of the University, its buildings exhibit a diverse range of architectural styles, representing the progression from humble monks' hostel to centre of academic excellence. However, the College's history has not been an easy one. Several Masters and patrons were implicated in treasonous activities in the 16th and 17th centuries and some were even executed! At the time of Buckler's visit, the College was trying to alleviate its financial problems.